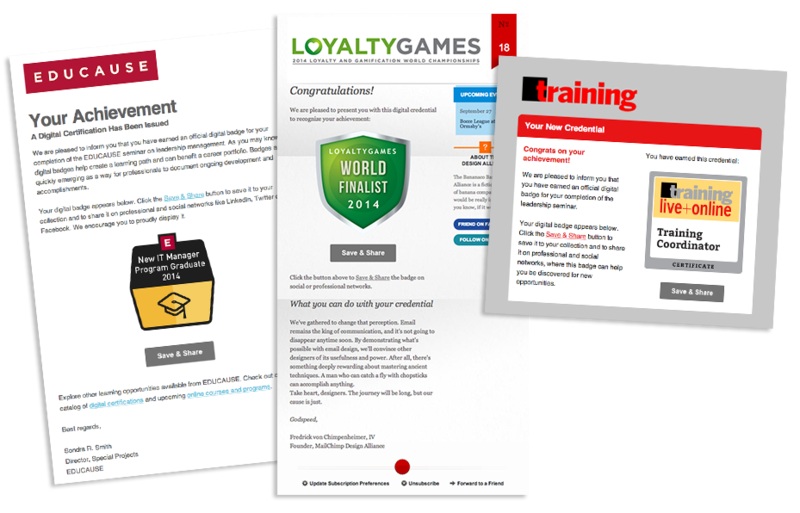 Use MailChimp email templates and lists to recognize achievement with official digital badges. Issuing a digital badge is one of the most powerful and visible ways to honor the skills, knowledge and actions that you value, and to illuminate new opportunities that an achievement unlocks. The new integration with MailChimp lets you easily insert official digital badges -- as well as calls to action to accept and share the credentials you issue -- directly into your beautiful, customized email templates. When you issue badges using "Credly for MailChimp", you control the entire message around the earning experience. Use MailChimp templates to express appreciation, offer awards or new benefits to earners, or provide links to new opportunities or programs. Awarding a badge is like a graduation ceremony; when people receive your email, they should feel great, accomplished and ready for what's next. Using Credly for MailChimp helps maximize excitement and audience engagement. But wait, there's more! The new integration let's easily bulk issue badges to members of any of your MailChimp lists. Use an existing list or upload a new one and then issue any of your Credly-created badges using your desired MailChimp template. Select all List members or just select certain recipients. As with other email marketing campaigns, sometimes you want to set the timing for the outreach for the optimal moment. Perhaps a badge should be delivered just as people are completing a seminar, arriving at en event, or returning home after a conference? Maybe you have found that the best time to reach your audience is on Thursday mornings? No problem. 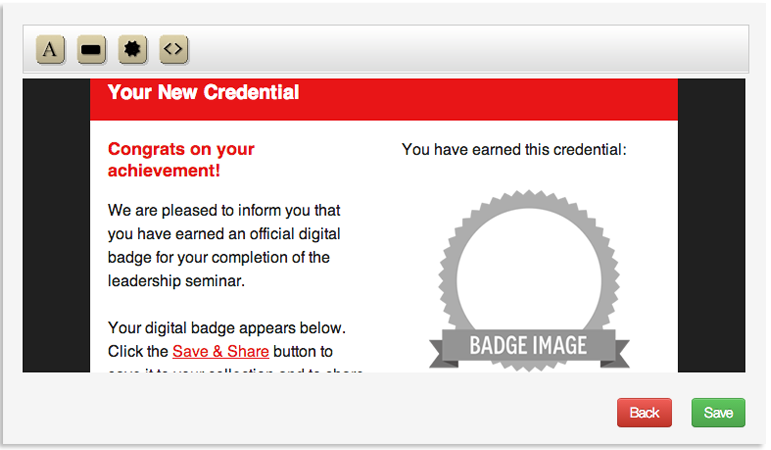 Schedule the issuing of your digital badges and credentials for the time that works best. • Link your MailChimp and Credly accounts. • "Credly-enable" one or more of your MailChimp templates using our simple WYSIWYG editor to insert placeholders for your badge image, save and share button or link. • Select recipients from MailChimp Lists or Credly Lists, or add new individuals in real time. Select a Credly badge to issue, the MailChimp template you'd like to use to communicate with recipients, and choose a delivery option for now or a future time. You can even include optional evidence or a testimonial to accompany your badge. Hit send! That's it! 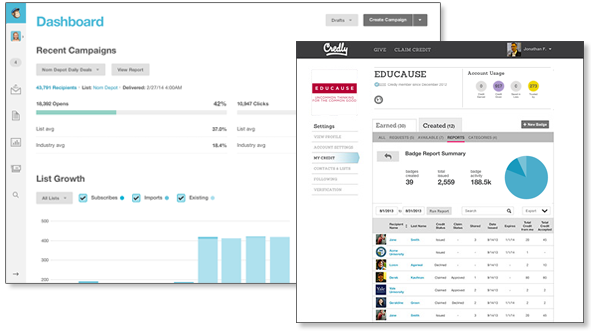 Track your campaigns using Credly and MailChimp reports. See a video tour of Credly for MailChimp on the Credly Blog. Credly for MailChimp is available now as a benefit to all Credly Pro members. Not yet a Pro Issuer? Upgrade today to take advantage of Custom Email Headers and enjoy many other benefits.